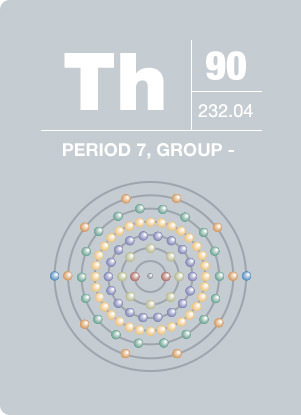 Named after Thor, a Scandinavian god of war, thorium is about three times more abundant than uranium. It is found in small amounts in rocks and soils, with abundant supplies in several countries. Monazite, a rare-earth and thorium-phosphate mineral containing twelve percent thorium oxide, is the primary source of the world’s thorium. Similar to uranium, thorium can be used as a fuel in a nuclear reactor and is a key factor in the sustainability of nuclear energy. Much of the earth’s heat is attributed to the decay of both uranium and thorium. When exposed to air, the element retains a silverish white color for about three months then slowly tarnishes to a grey then black color. The primary use of thorium is for strong alloys and ultraviolet photoelectric cells.